So.....I thought it might be time for a tutorial. I have to admit that I learn many things through trial and error. The good thing about this is that I get lots of practice!! Following on from my last post about social media marketing and one of the points about technology, I thought it pertinent to post a tutorial on video making. There is a ton of expensive software out there, but I prefer to manage as much as I can on a budget! Many sellers reach the stage of trying to find new ways to get their products in front of potential buyers - we all know about making eye-catching pins for Pinterest, facebooks ads and so on - the advice is endless and we twist ourselves in knots trying to keep up with it all! What we try never seems to be enough and we strive to move on to the next 'big' thing that will improve our sales! The current trend, especially on facebook, is to promote our products via the medium of video. There are lots of great phone apps out there like Ripl, Adobe Spark Post etc - these are great if you want to create 'on the go' and are time poor, but the end results can leave a lot to be desired. I do like Kizoa and imovie, but I am a bit old school and like to create on my computer. My preferred desktop app for Windows is Movie Maker. I love spending time creating videos, but yes, it is not a quick fix! 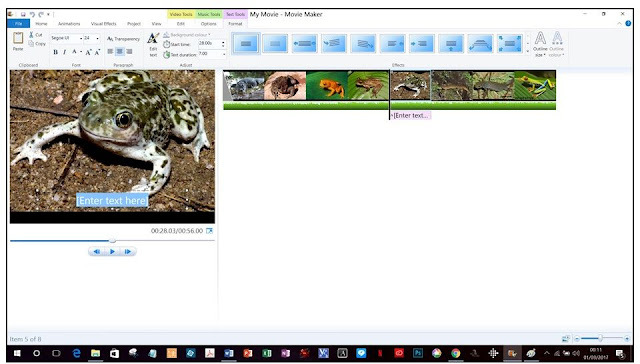 After you have organized your files, you can import them into the Windows Live Movie Maker. The pictures and video clips can be imported by clicking either of the two Add videos and photos buttons (one at the Home tab and the other at the storyboard) > locate the file folder(s) > select all the files to be used for the project > click Open > the files will be imported into the storyboard/timeline. Below is the view of the imported images in the storyboard. 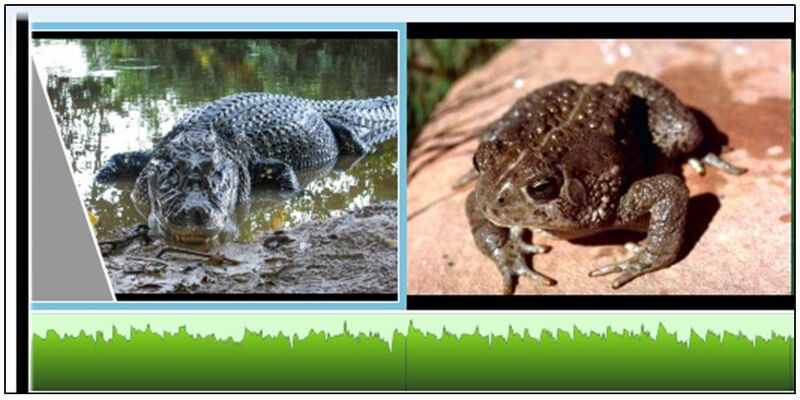 You can change the sizes of the images in the timeline - just click on View and choose the size you want. If you intend to have music accompany your movie, you should import the music file early on since the music will dictate how the images/videos will be edited in the timeline. To import the music file just click the Add Music icon (you have the option to add your music at the start of the project or at specific parts of the timeline) > locate the file folder > select the music file > click Open. 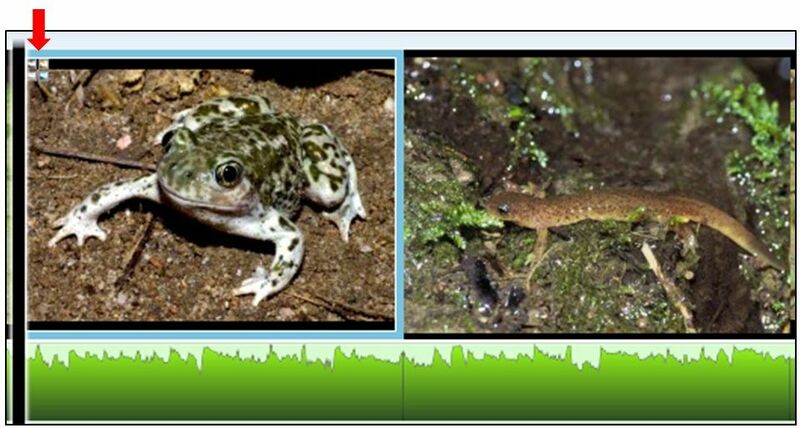 The imported music file will appear as a green bar below the images, with its duration visually depicted by the length of the bar. 3. Save your project now! 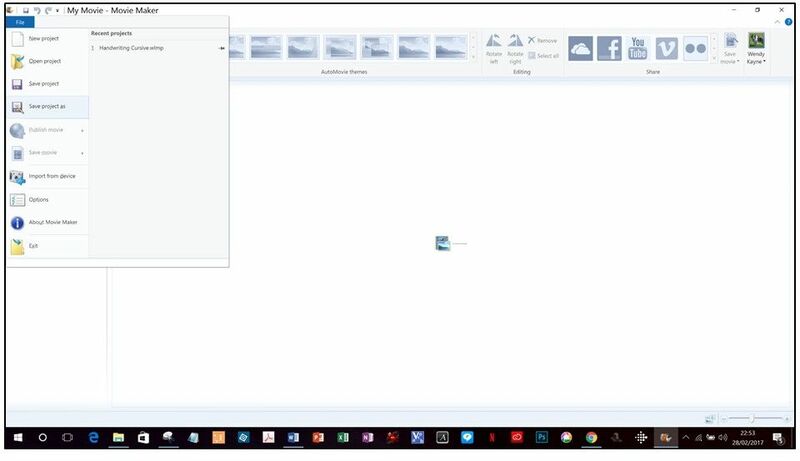 Choose a save location on your computer and enter a name for your file in the file name field. You can move the image and video files according to the order of appearance in the movie by dragging the thumbnails left/right/up/down. This is where the pre-organization of files will prove to be beneficial - if you re-named your files in chronological order then they will be imported and placed in the timeline in the same order - so no need to move and arrange them one-by-one. Duplicating Files: you can copy images/videos/music files by simply selecting the thumbnail/item > click the Copy icon > paste it on the specified point in the timeline. The copied file will have the same added effects as the original file. Removing Files: just select the file(s) you'd like to remove and click the Remove icon or press the Delete key. 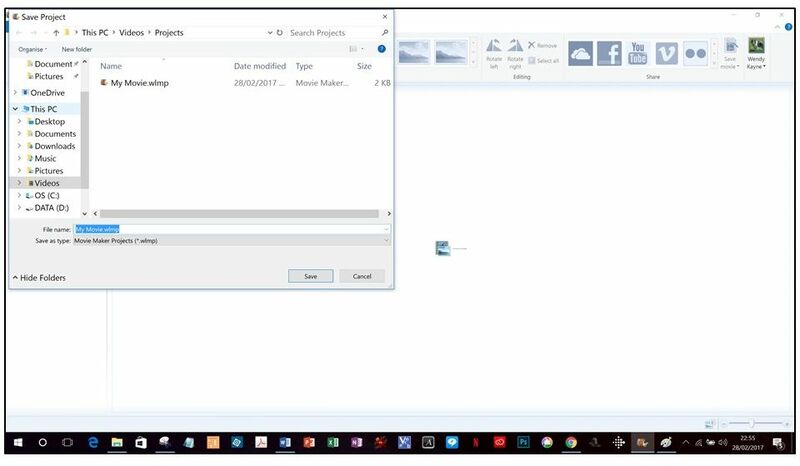 Selecting Files: you can select a single file (clicking on a thumbnail/item), multiple files (batch selection using Ctrl+mouse click), or all files (clicking the Select all icon or pressing Ctrl+A). 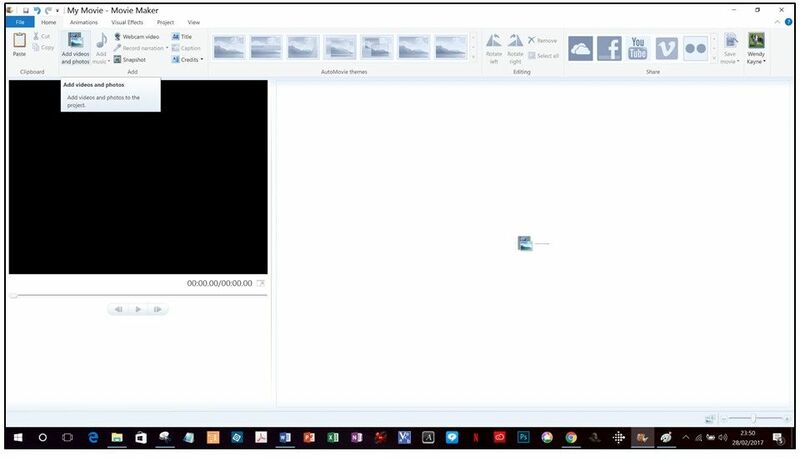 Rotating Images/Videos: click on the Rotate Left or Rotate Right icon to change the orientation of your images or videos. 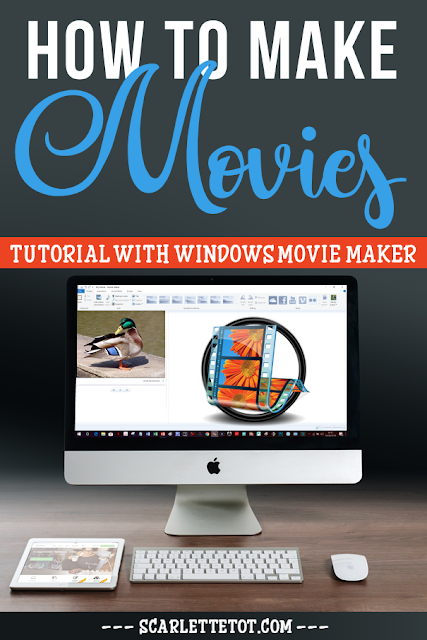 Movie Maker comes with sets of special animation and visual effects that you could use to make your movie more attractive. These include transition effects, pan and zoom effects, visual effects, and pre-set AutoMovie themes. Set the time duration of the transition either by typing in the exact time or choosing from the pre-set time durations. A grey triangle will appear on the left side of the clip thumbnail indicating that the transition effect has been applied. To change or remove transitions, click on the image or video and choose No Transition or choose other transitions. Select the picture or video clip you'd like to add an effect to. A four-square icon will appear on the top left corner of the clip thumbnail indicating the pan and zoom effect has been applied. Select the image/video you'd like to give a visual effect > click the Visual Effects tab > choose the desired effect. Like with the transitions and pan and zoom effects, you have the option to apply a specific visual effect to all of your images/videos by clicking the Apply to all button. The AutoMovie themes can be accessed under the Home tab, and by clicking on a selected theme, its pre-defined animations and visual effects will automatically be applied to your images and video clips in your storyboard. You have the option to adjust your images and videos to fit the theme or adjust the theme settings to fit your set of images and videos. Text can also be added in your movie project in the form of titles, captions, and credits. These three differ in their locations within the timeline: titles are added at the start of the movie, captions added in the middle, while credits are added in the end. 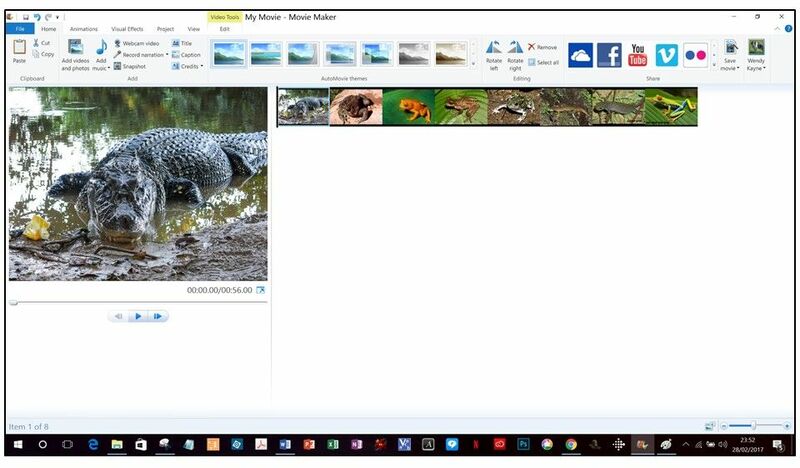 These can be added by clicking either the Title, Caption, or Credit icons in the Home tab > a text box will appear in the particular slide or image/video > type in the text > re-size the text box dimensions as needed > move by dragging the text box to the desired area in the screen. Texts appear as pink-colored bars at the bottom of the pictures and video clips in the timeline. So, that's it! Simple, right?! Actually when written down, it can look overwhelming - the best way is to just have a go and play! If you click on the video below, you will see one of my movies. The only difference is that my clips are not photos. I created my images in PowerPoint first and then saved each as a JPEG - the process is exactly the same, except this step. As you can see, something extra has been added to my movie - this is a Video Intro!! I wanted to add my logo so potential buyers would recognize my brand, so I added an animated video to the beginning of my movie. When making a movie using Movie Maker, all you have to do is add the video intro as one of your clips. 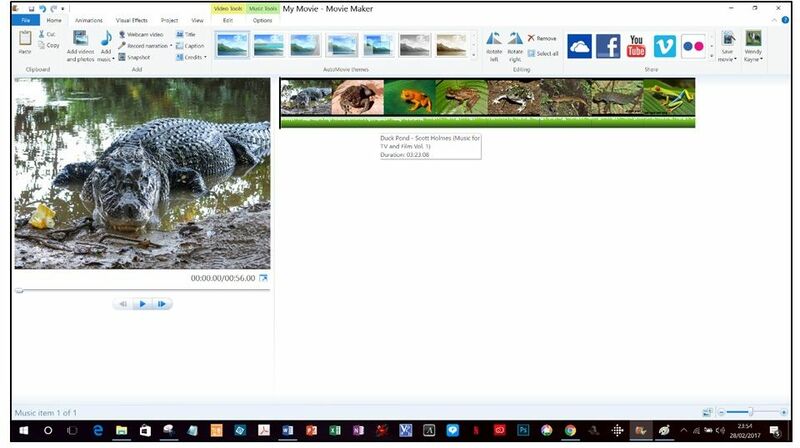 As mentioned in the tutorial - BOTH videos and photos/images can be added to your storyline to make a movie/video to promote your products. These video intros are fun and just add a little something extra to spice up your video! They let potential buyers know who you are and where to find your resource. If you are interested in viewing my range of video intros and would like some custom intros made, just hope on over to this page to read all about them!